There is a small black ribbon (a symbol of remembrance or mourning) at the bottom of Google’s Singapore homepage. Singaporeans are in mourning for one week as we recently lost our first prime minister. He was not just another prime minister, he was the “Father” of Singapore. Mr Lee Kuan Yew led Singapore from a British Colony to an independent country. He strived hard to put the nation on the world map. TM frequently made a remark “No list consisting of top ten great global achievements is complete without Singapore being a part of it.” Whatever we are today, is it largely because of the late Mr Lee. I am definitely going to miss watching the television camera panning at him during the National Day and since Singapore is going to turn 50 this year, it is going to be harder. SG50 celebration this year without the late Mr Lee will be incomplete. May god keep his soul in peace. My cousin had dedicated an entire blog post to him. If you want to know more about the great man, you can check out the post here. I have always aimed to blog three times a week, but in reality, even once a week is getting hard at the moment. I am gonna be settled at the new place by the month of May and I hope that I would be able to blog more frequently once I am no longer at the beck and call of the parasitic life. My BCF (best cousin forever) still comes over once a week to give tuition to my niece and I try my best to cook something for her whenever she comes. I was planning to whisk up a prompt and easy pasta dish for the two of us. Problem is, it would end up being enough for 6 people. Moderation has never been my virtue when it comes to cooking for others. This pantry pasta recipe is really versatile and you can basically throw whatever you have in your fridge. Obviously, when I say everything, doesn’t mean you can start throwing chocolate chips and apple sauce in your pasta. 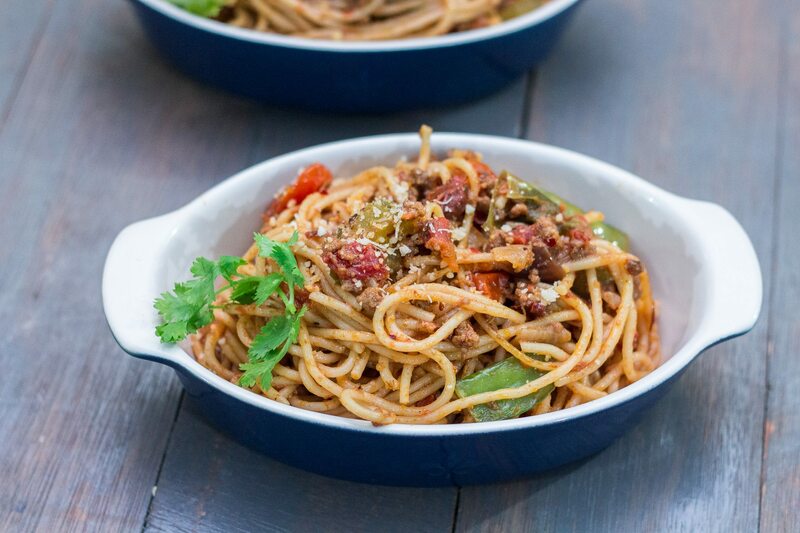 I ransacked the fridge and I found a whole lot of ingredients like peppers, sun-dried tomatoes, snow peas, minced beef and tomatoes. All yummy stuffs! I started by sauteing the aromatics, followed by the minced beef. Once the minced beef browns, I poured the canned tomatoes and simmer this for a bit before tossing in the vegetables and pasta and topping it with CHEESE. How easy was that? Pasta and cheese goes hand in hand. It’s like garlic + olive oil, strawberry + cream, chocolate + sea salt, romeo + juliet, erm ok…time to stop. 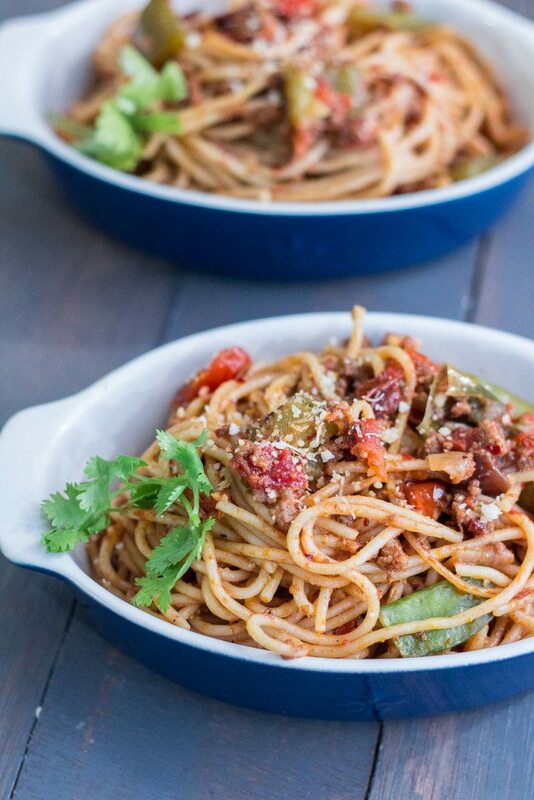 This is a really easy dish to throw together and the results are wonderful. Do give this recipe a try, grab a fork and dig in people. Feel free to go for seconds or thirds as this recipe would feed 6 hungry humans or 4 hungry cows. Saute the onions into a skillet with the olive oil over medium heat for a few minutes. Mix in the garlic, sundried tomatoes and saute for another 2 minutes. 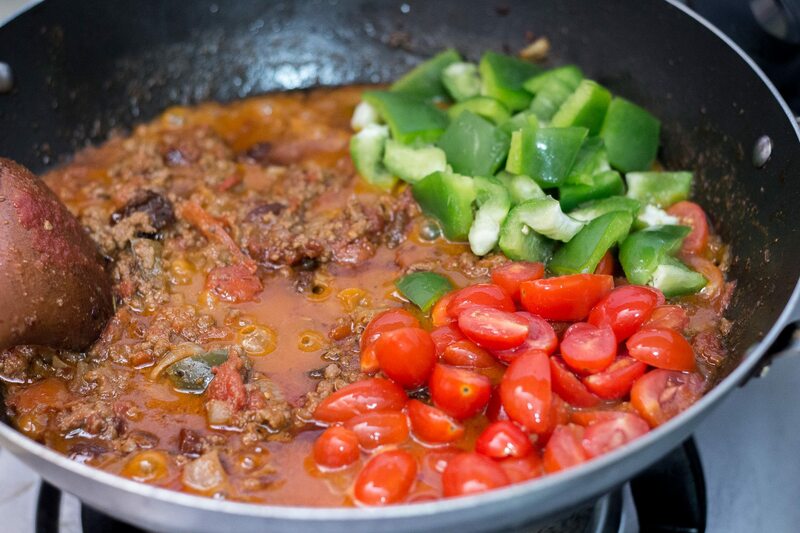 Add in minced beef and cook till brown. Pour in the canned tomatoes and season with salt and pepper. Cook for 15 minutes, till sauce thickens. Add in the peppers, tomatoes, snow peas and spaghetti. Pour in some of the pasta water and stir the pasta for a good 5 minutes. Mix in the butter and parmesan. Season with more salt and black pepper if required. Dish up and top with more parmesan and parsley. I definitely am feeling for pasta after this post. Looks delicious!